There’s a major "Gilmore Girls" connection in "The Marvelous Mrs. Maisel"
While we may not be getting any more Gilmore Girls — yet, because we’re still holding out hope for the future — we can still get our Amy Sherman-Palladino fix. Her new series, The Marvelous Mrs. Maisel, begins streaming on Amazon tomorrow (November 29th). It follows Miriam “Midge” Maisel (Rachel Brosnahan), a wealthy New York City housewife who, after her husband unexpectedly leaves her, stumbles into the world of stand-up comedy. While the outset of Mrs. Maisel seems very different from Gilmore Girls (and Bunheads), the series has everything fans of Sherman-Palladino have come to love. Think fast-talking, pop culture, and family disfunction, oh my! 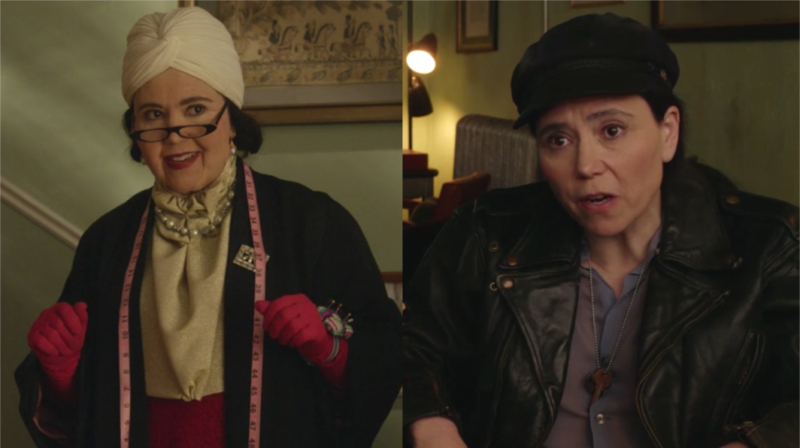 In fact, the series is so quintessentially Sherman-Palladino, it even stars Alex Borstein as Susie, who guides Midge through the New York comedy scene and is clearly set to be one of the show’s breakout characters. While Borstein has been been a longtime member of the Sherman-Palladino repertoire, with small roles on Gilmore Girls and Bunheads, her collaboration with Sherman-Palladino is nearly two decades in the making. Earlier this year, the Gilmore Girls creator revealed that Borstein was initially set to play Sookie on the beloved WB series before the actress’ commitment to MadTV got in the way. Luckily, the stars finally aligned for the duo, with Sherman-Palladino reportedly writing the role of Susie for Borstein. "That's what they say. A lot of times they say that just to make you feel good about yourself. Well, Amy told me about the show while she was developing it a few years ago," Borstein told E! News. "We had lunch and she's like, ‘We're working on this.' I don't know if she's testing the waters to see if I'd like the area and I said, ‘That sounds amazing.' I choose to believe her, maybe she did write it for me." We’re choosing to believe it, too. Because after watching the pilot, the role of Susie does seem made for Borstein. The pilot for Mrs. Maisel was released as part of Amazon’s spring pilot program and was met with such critical acclaim, it was picked up for an unprecedented two seasons at the streaming platform. The series also stars Michael Zegen, Marin Hinkle, and Tony Shalhoub. The complete first season of The Marvelous Mrs. Maisel will be available to stream on Amazon on November 29th.